Until May 2009 I had not appreciated that Singapore balls existed, that is, until I watched a very interesting and informative demonstration by Bob Chapman. With that in mind, and having also seen the work of David Springett, my interest grew. I knew I just had to have a go at making one. exercise. For me, the real interest is the technical challenge, and watching the look that spreads over the face of people as they try to figure out how the piece has been made. All too often, turners - including myself - tend to avoid this type of project because of the many special tools you need. 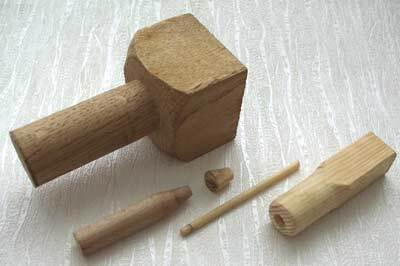 Having carefully assessed what was really needed to make a ball, the bottom line turned out to be no more than 1) an accurate template to make the ball; 2) a cage to hold the ball whilst drilling; 3) an odd shaped chisel for the hollowing, and 4) a few useful bits and pieces made from scrap. Firstly, decide what size you would like your balls to be. You need to be able to get your fingers well round, but not all the way. For me, the best size has turned out to be 64mm (2 5/8in), but do not try to go too small. 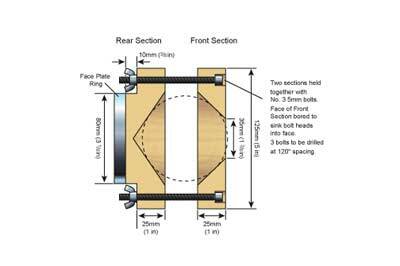 To make the ball cutting jig cut a 100mm (4in) square of 4mm MDF, screw it to a back plate, mark it with a 64mm (2 5/8in) diameter circle and then, at VERY high spindle speed, cut the marked hole with a point tool. Remove the square from the back plate, cut it into three differing sized sections, and clean up the corners. You now have a selection of perfect templates to help you create a ball. 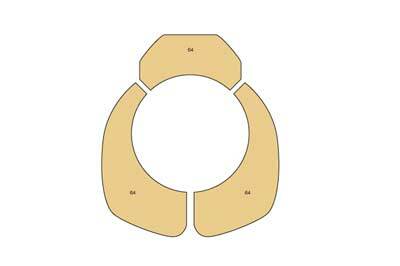 Mark each section with the template diameter and keep all the bits for future use. Whilst the ball is being drilled and hollowed it needs to be held firmly inside a cage. This is constructed from two pieces of hard, stable timber - I used 40mm (1 5/8in) beech (Fagus sylvatica). Cut a dovetail spigot on the rear of the back section, or if you can, use a permanently attached faceplate ring for your mounting point. The front and rear sections are held together with three long 5mm (3/16in) bolts running through both sections. The bolt holes are each drilled 120 degrees apart on a 110mm (4 1/4in) diameter circle and the holes on the front face are recessed to remove the bolt heads from "the pink fleshy zone." The overall diameter of the cage is 125mm (5in) and the mating faces each have a deep conical section removed to allow balls of a differing size to be clamped within. The front section of the cage is thinner than the rear section. This allows its conical recess to penetrate right through to the outer front face giving you the essential drilling access to the ball. The tool I use is a modified HSS 10mm (3/8in) square-end scraper. 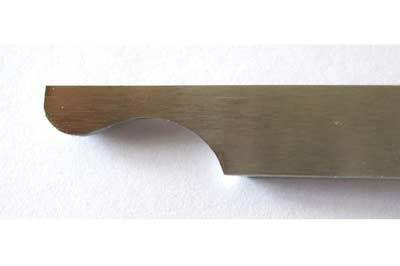 The first 20mm (3/4in) of the blade has been modified into a "hockey stick" shape where the bulbous end measures 6mm (1/4in) across and the "stick" has been wasted in to no more than 4mm (5/32in). This is very easy to make, and takes only a few minutes on the grinder. Start by marking the material you need to remove and don't be tempted to start grinding until you are happy with the outline. But remember to keep the blade nice and cool. 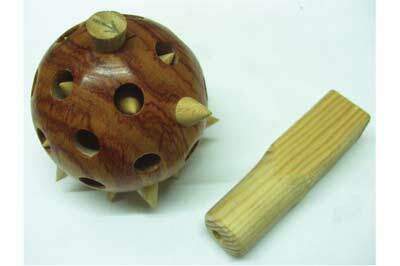 The balls are best made using close, dense-grained hardwoods, such as Brazilian tulip (Dalbergia frutescens), or similar. 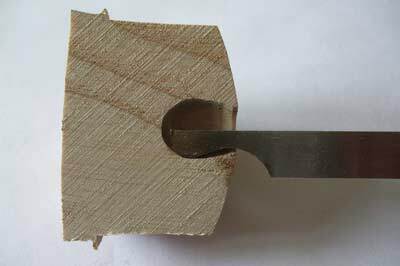 Mount the blank between centres, rough down to 66mm (2 5/8in) diameter - 2mm over size - and cut a dovetail spigot on one end. 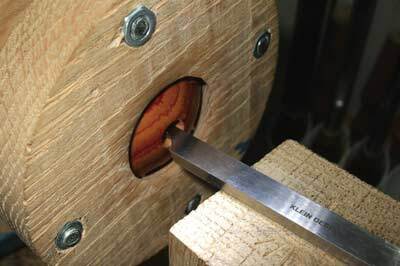 Remount the piece in the chuck and start to make a dome shape cut on the free end. And this is where the MDF template comes into play. Keep a regular check on the shape you are cutting using the smallest piece of your MDF template and do not be tempted to move on to any other part of the ball until you achieve a perfect fit. Gradually work back towards the headstock in steps of about 10mm (3/8in), aiming for that perfect fit at all times. 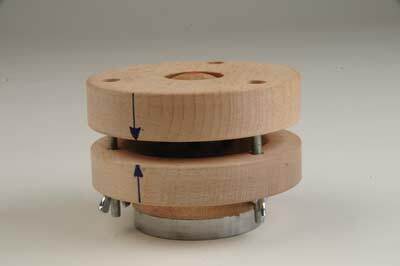 As soon as is practical, add tailstock support with a live centre (do not use a ring centre). As you approach the blind corner near the spigot you will need to use a cutting template, which is elongated and has been thinned down into a hook shape, but other than that, the process remains the same. 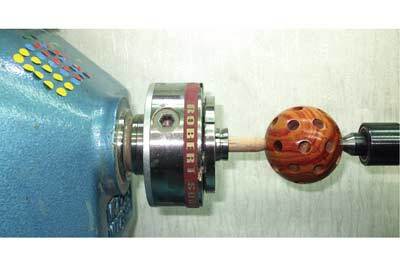 Keep going until you get down to less than 10mm (3/8in) of wood holding the ball onto the spigot. Sand through the grits to about 400. Complete the parting off process as neat as you can and sand off any remaining bumps to leave a good, clean ball. Do not be tempted to try and remove the mark left by the live centre. This is a very important reference point and for the remainder of this article, it will always be referred to as "TOP OF BALL." For a Singapore ball to work well, it is most important that it be made with accuracy. 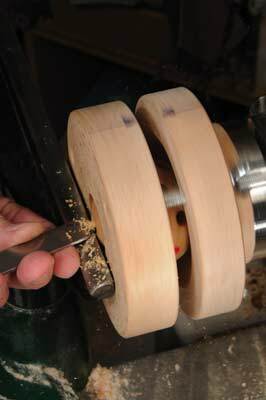 Using this cutting method I have found I can make a ball having less than one millimetre error, which is better than any jig I have seen, made, or tried. Marking out consists of defining a pattern of 32 equidistant points on the surface. Take several accurate measurements of the diameter, i.e., top to bottom, side to side, and several points in between, then calculate the average, multiply your answer by 0.526, and round up the result to the next whole number. This gives you the "primary radius." Using the layout diagram as a guide, set a compass to the primary radius, and with the point in mark No.1 - TOP OF BALL - draw a clear circle, but not too heavily. 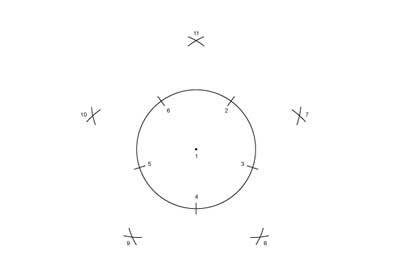 Using the same primary radius, sub-divide the circle into five equal parts - points numbered 2-6 on the diagram. Working from successive pairs of the points numbered 2 to 6, project the next 5, each being the peak of an equilateral triangle. For example, from points 2 and 3, mark point 7. Now you should be able to scribe a mark onto the BOTTOM of the ball from each of the points numbered 7-11. These five rarely meet up correctly, normally leaving you with a small five-sided pentagon on the bottom of the ball. Carefully judge the centre of the pentagon to locate point number 12. This now gives you a defined top and bottom, plus two circles of five points - all known as the 12 primaries. Make a sharp indentation with an awl at the 12 locations and sand off all your pencil marks. You will soon realise that the 12 points you have marked define 20 triangles. The remaining 20 points you need to locate on the surface are at the centre of each of the triangles. Locate each one by setting the compass to a suitably small radius and scribe three marks - one from each corner of the triangle. Make a sharp indentation with an awl at the 20 centres and sand off all pencil marks. 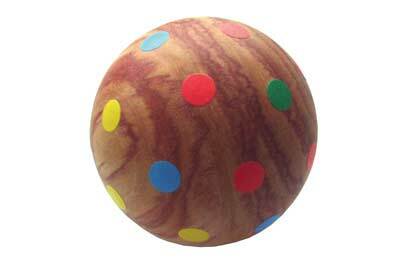 On the fully marked ball I have put a green spot on the top and bottom, a blue spot on the 10 remaining primary points, red spots on the secondary rings round the top and bottom, and yellow spots round the middle. I find this is a good aid to help keep track of where you are when you start to drill and hollow the ball. Trial and error has taught me that drilling the ball too deep or too wide will cause the holes to merge in the centre. If that happens the ball will not work and if you keep going, you will finish up with a rattle, which is obviously not what we want. As a general guide, the drilling depth needs to be close to one quarter of the ball diameter. Also, a 64mm (2 5/8in) ball can be safely drilled to a depth of 16mm (5/8in) using a 9mm (11/32in) bit. Altering the drill size or depth will have a marked effect on the final feel of the ball. 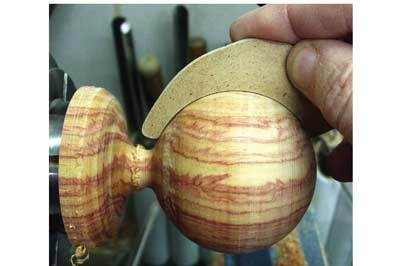 For example, drilling shorter and wider will give you a ball with a softer feel, and vice versa. For those who want to experiment with the drilling process, you can calculate the maximum drilling diameter by taking twice the drill depth away from the ball diameter and then multiply the remainder by 0.3142. 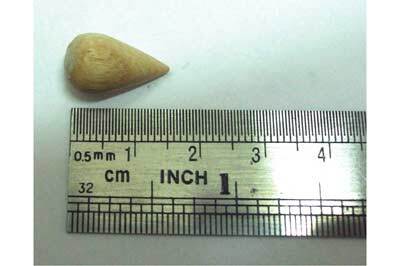 Using the formula noted above, the maximum drill size for a 64mm (2 5/8in) ball, drilled to a depth of 16mm (5/8in), is 64 (minus 2 times 16) multiplied by 0.3142, equals 10.05mm. Thus, a 9mm (11/32in) drill is 1.05mm within the safe drilling limit. The following process needs to be repeated for each of the 32 holes. There is no fixed order you should adopt, but as stated earlier, I do proceed through the grouped colours to allow me to keep track of progress being made. ALWAYS drill the top and bottom holes first, then mark the inside of each with a felt tip pen so they can easily be identified later. 6. The final step is to sand the outer surface of the hole with 400 grit abrasive paper. 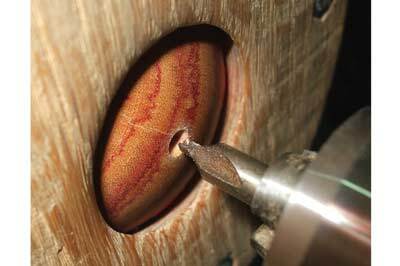 Using the "hockey stick" chisel and the flat-topped toolrest, hollow out the inner sanctum of the hole a little, making sure you leave the entrance intact and unchanged. The final picture in this section shows a piece of timber which has been drilled and hollowed, then sliced in half. The image clearly shows the "hockey stick" tool and a hole with a hollowed interior. Hone the tool for a finer finish. With all 32 holes drilled and hollowed, remove the ball from the cage and admire your work - the worst is now over. 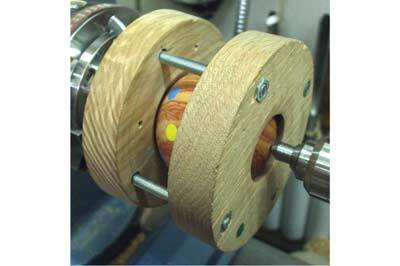 Mount the ball between its top and bottom points using the tapered dowel in the chuck and a live centre in the tailstock. Re-sand the whole thing and finish as you feel fit. This piece of tulipwood was coated in melamine lacquer and then polished to a high shine. In this picture you can see the 32 coloured dots still stuck to the headstock, each one having been removed prior to the related drilling operation. Not surprisingly, you need to make and fit 32 of them. 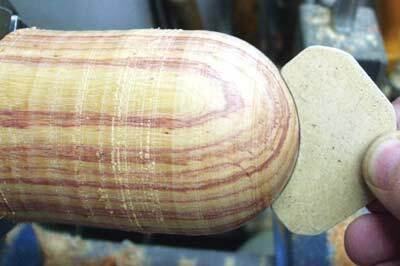 I normally use pre-turned dowel for ease (look at www. plugitdowel.co.uk) but it is not essential. 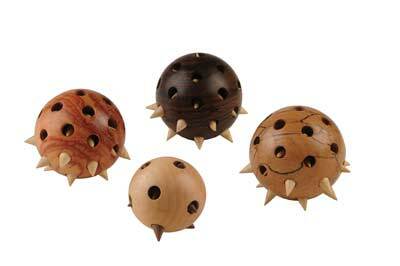 My only advice here is to use wood which is less dense than the ball but harder than pine (Pinus spp.). I like to use material having a contrasting colour. Using a similar colour adds to the mystery of how the ball is made, but in some ways, I think it detracts from the final appearance - the choice is yours. In theory, all the holes are of the same depth and diameter, but in practice, they rarely are, so every point you make needs to fit each individual hole. Just like the drilling, repeat the following 32 times. If you have got it right, the teardrop will click into place with firm finger pressure. 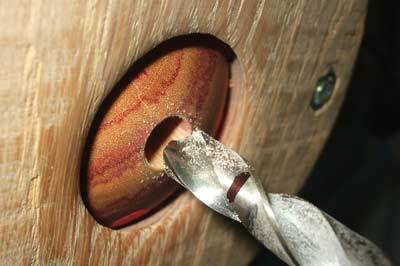 If necessary, use the small section of pine with its pre-drilled and flared hole to force the teardrop into the ball. If you have got it wrong, the teardrop will fall into the hole, and when inverted, it will fall out again. If so, do not toss the teardrop into the rubbish bin, try it in another hole - it may well fit better somewhere else. Another problem you may encounter is that the hollowing may not be quite enough, and the teardrop will jam in the back of the hole. If this happens, remove the teardrop with a small chisel, put the ball back in the cage, and hollow out the hole a little more, then make a new teardrop for the hole. Have fun, and send me some pictures of your efforts. Also, feel free to get in touch if you need any more explanation (see contact details at the start of the article). Jon has been a woodturner for 46 years, having started in 1964 at school. He then had 43 years off, returning to the hobby in 2007 after two days of tuition with Nick Arnull. His skills are now being fine tuned and extended in many directions by Colin Hovland, a fellow turner who has 30 years of experience. Jon says that he still has much to learn, but he is proud of what he has achieved so far.